← How to convert html to emf format? 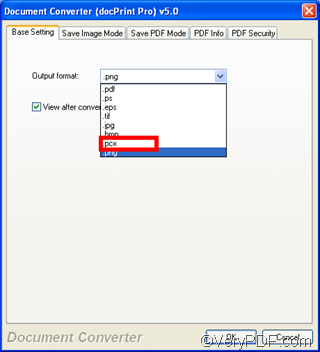 Can I convert lots of Office documents to PCX format? As a matter of fact, VeryPDF docPrint pro is a document converter which can\convert any printable documents to BMP, DCX, EMF, WMF, GIF, JPG, MNG, PBM, PCD, PCX, PGM, PIC, PSD, PNG, PNM, PPM, TGA, TIFF, AVS, JBG, JP2, PDF, PS, EPS, WBMP, XBMP, XPM, etc. files. etc. files. In addition, you can enhances your applications by expanding their output capabilities. It also provides a regular console interface and GUI interface to batch convert document files. To download VeryPDF docPrint pro or read more information of VeryPDF docPrint, please visit the following website at http://www.verypdf.com/artprint/index.html . Or you can click “Add files”>select all the files you want to convert from Word to PCX files. Click “Start” to run the “save as” dialog box> select a proper directory to save the outputting files.>click “OK” to start converting. Open the saved PCX files you have converted from Word documnt, and scroll through it to confirm that the text and images have been converted appropriately. In most cases, VeryPDF docPrint pro saves Word documents as PCX files with impressive integrity, However, depending on the way the document was created and originally encoded, you may need to adjust spacing or make minor correction. How to convert documents of MS Office to pcx? How to convert files of AutoCAD to ept? How to convert OpenOffice documents of ODT to FAX? How to convert documents of OpenOffice to FAX? This entry was posted in docPrint Pro and tagged office to PCX. Bookmark the permalink.